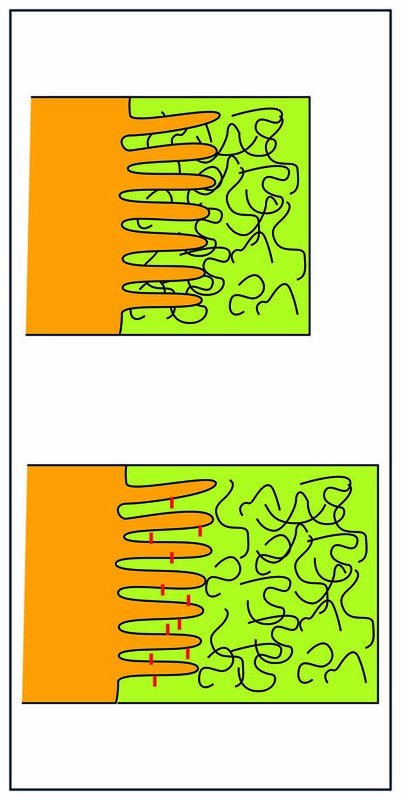 Top image: Mucus layer (green) is a suspension of long molecules (black wiggles) which give mucus its characteristic viscosity. You might expect these molecules to penetrate between villi on the surface of the airway (brown), and thus impede the flow of mucus. On page 55 of Life on the Dock (LOTD), in the paragraph titled "Filter feeding", I discuss the mucus net that the tunicate Ciona makes to trap its food. It pumps water in through the oral siphon, then forces it through a mucus net that traps food particles. Live food may be as large as a small copepod or as small as a bacterium. In addition, there are many fragments of dead organism in the water next to the Dock that are also trapped in the net. The mucus net is then pulled down into the stomach and digested along with any food trapped in it. A good example of recycling at several levels. This may seem to us a strange way to eat, but maybe the basic process is shared with the tunicates? We get our oxygen from the air by filling and emptying our lungs every second or so. All air contains particles of "dirt", hair, dead skin, bacteria etc. That is why we need to "dust" furniture every few days if we want to keep a clean house. It's why central heating and air conditioning systems have filters which must be cleaned every few months. How do we keep our airways (the tubes leading from our nose and mouth to lungs) clean? When you open your mouth and look inside you see the surface is shiny, e. i. wet. The dirt in the air you breath becomes trapped in the wet surface. But the wet surface is actually a layer of mucus, produced by cells in the lungs, and constantly moved up the airway by the beating of tiny villi (fingers the size of cells). The mucus ends up into your mouth and every few seconds you swallow, and the mucus that has collected goes into your stomach. This process is of course mostly unconscious, you usually don't even notice you are swallowing mucus. We often only appreciate something when we loose it. People who are suffering from cystic fibrosis have a defective mucus producing machine; their mucus has less water than normal. This means that it is very viscous and can't be easily moved by the villi; it just stays in the lungs. They have to induce coughing to move the mucus, and this process can be painful. In addition, the slow clearance of mucus allows bacteria to grow and injure tissue. It can be very unpleasant and incapacitating. There is considerable research being done to understand the mucus machine, and help people that have a defective one. Just last year the front cover of Science , depicted a mechanism by which the mucus layer is excluded from the spaces between the villi that move it. As seen in the top panel to the right, you could imagine the polymers that make up mucus diffusing into the villi and slowing down transport. Button et al. discovered molecules attached to the walls of villi that keep the mucus out, and thus allow more rapid transport.